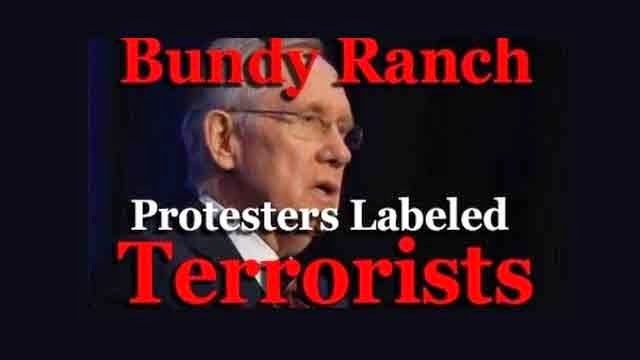 Harry Reid’s public assertion that the brave men and women that traveled to Nevada, from across the country, to protect and defend Mr. Cliven Bundy in a range war against out-of-control, abusive, overreaching federal government agents from the Bureau of Land Management (BLM), were “domestoc terrorists,” was deliberately stated to create a “label” for those willing to fight against a tyrannical government. Make no mistake, the alternative media and social media across the Internet, that spotlighted Mr. Bundy’s plight, highlighted the governments physical abuse on peaceful protesters and made sure the pre-made signs declaring “First Amendment Area” that the federal government posted in zones, as if the whole United States of America wasn’t a free speech zone, was responsible for bringing freedom loving Americans together to stand against the tyranny being perpetrated against Mr. Bundy, and the US government wants to limit free speech across the Internet because of our success. Thy lost, the were forced to back off, return Bundy’s cattle because Americans stood up and said enough. In the video below, Lee Ann Mcadoo from InfoWars explains a new bill being proposed for no other purpose than to intimidate freedom fighters into staying quiet in the face of tyranny. To paraphrase what someone in an email said to me, better to be a “domestic terrorist” in the eyes of crooked scum like Harry Reid, than to be a “Domestic Enemy” as Reid and his ilk are in the eyes of Americans!